Since more and more small businesses battle over the same clientele each year, finding new and effective promotional ideas that work to target those customers is critical. The line between success and failure often comes down to promotion – it’s as simple as that. So how do you tackle the challenge of getting people to find out about your service or product? Sometimes all you need is a good idea to give your business a promotional boost. Here are 80 simple ways to help thrust your product or organization into the spotlight. These are techniques that involve making a product or service more accessible or affordable, or simply adding value. 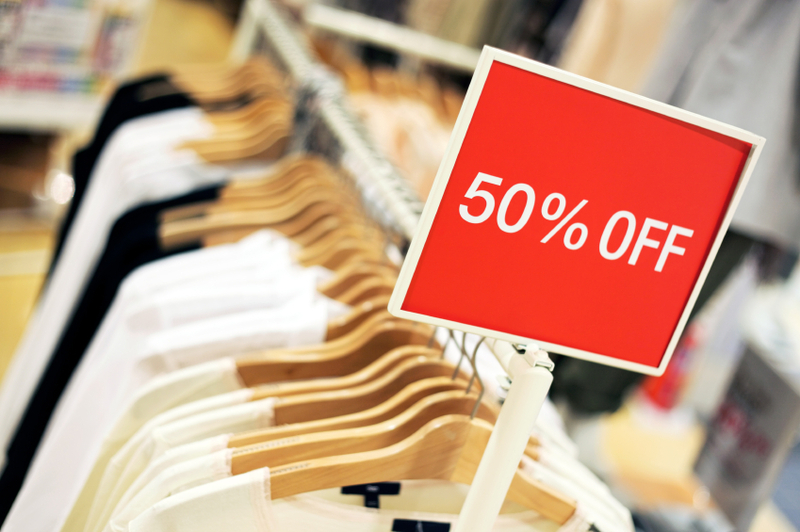 Offering a sale or discount can attract people to your product. But having too many can work against you. Have a sale – You can offer a holiday or other discount to either the general public or your best customers. Just be careful not to offer too many; your customers might begin to wait for a sale instead of buying things at regular price. Hold a contest – Offer to automatically enter your customers into a contest when they make a purchase. You could also offer your product as the price for one being held by other small businesses. Either way, make sure that the contest revolves around you and your product. Give something away for free – Hand out samples of your product, promotional products branded with your logo, or other gifts at a key location. This lets people experience what you have to offer first-hand at a key location. Frequent shopper cards – Offer customers a discount or free product after they’ve made a specific number of purchases. Give discounts to targeted groups – This could be a specific club or association, or simply a group of people who have attended a specific event. Offer a trade-in – Reward customer loyalty by encouraging them to trade in their old product for a discount on something new. Point-of-sale displays – Present your in-store products in an unusual way. Stack them in a huge pyramid, or use oddly shaped signs. If you have a window out front, create a wacky display using mannequins or other fun objects. Offer free shipping – The word “free” is always attractive to customers, and free shipping is usually a reasonable discount. Offer easy payments or installment plans – These are simple ideas that attract customers by making your products more affordable. Offer a group or referral discount – These are the sort of discounts that get people talking. Encourage customers to share a deal with others, and they’ll do the promotional work for you. Bundle products or services together – Package no-selling products with your more popular products. Giving a customer more for less both encourages them to buy and clears your idle inventory. Upsell – Highlight your more expensive products. Give those products more attention in your store or on your website. Provide benefits and reasons why those products are better. Cross-sell – Customers are more likely to buy from you again right after a purchase. This is a great opportunity to cross-sell a complementary product. Create coupons – Coupons can be advertised in coupon books or mail packets, or on bulletin boards in high traffic areas. You can also add them to any marketing collateral that you distribute, such as brochures or sale sheets. Offer upgrades – Let customers know when there is an opportunity to upgrade a product to make it better or add additional functions. Sell replacement parts – Determine your product’s lifecycle and find out when it tends to start getting worn out. Stay in contact with your customers to make it easier for them to get the product fixed. Offer guarantees – A guarantee helps inspire confidence in buyers and highlights your integrity. Easy return policy – Impulse buyers will be more likely to purchase items that they can easily return later if they choose. Free trial – Offer a free trial of your product so that potential buyers can become more acquainted with it. Business card coupon – Print the back of your business card so that it doubles as a coupon. This will encourage people you meet to purchase from you as well. Direct marketing and advertising persuades your audience to take action by targeting them in an appealing, creative way. This could include video, audio, print or electronic media. Use your car or truck – You can follow Nascar’s lead by covering your vehicle withvinyl wrapping or magnetic signs that advertise your business. Signs, banners and posters – Keep paper materials that promote sales, offers and promotions close at hand, and use them when opportunities present themselves. Place them in public places or get permission to display them in private businesses where people gather. Business cards – Always carry business cards with you and give them to new acquaintances, close associates and anyone who might need to contact you. Give customers extra cards with the incentive of a free service or discount when they refer someone they know to your business. Promotional products – Printed custom products such as drinkware or keychains can be given as gifts or used at a special event. Brochures – Specialized brochures are a great place to feature a new product or service. Postcards – Handwritten postcards are cheaper than letters, and are great for reaching out to prospects. Try sending these for anniversaries, birthdays or holidays. Newsletters – A newsletter allows you to communicate with prospects on a regular basis. Direct mail – Catalogs, brochures, and other materials can be mailed directly to your prospects. E-mail blasts– Create an eye-catching e-mail newsletter that piques people’s curiosity and encourages them to subscribe. Calendars– Create a promotional calendar featuring your products and other information about your company. Sidewalk chalk – Write a creative marketing message in places where people are likely to see it. Sidewalk chalk is especially popular on college campuses. Hire an ad agency or marketing firm – You may want to entrust your company’s promotions to professionals outside of your own company. Be sure to do research and find a firm with the expertise you need. Alternate-reality game – An ARG is like an elaborate scavenger hunt that ties in with your product. It can take place either online or in real life. Participants might involve their friends and attract even more people to your brand. Automatic e-mails – Try setting up your e-commerce website so that it automatically sends customers an e-mail when they abandon their shopping cart. Create a commercial – Produce an ad to air on the radio, TV, cable, or even before a movie at your local theater. Newspaper or magazine ad – Take out ad space in a periodical to appeal to a specialized audience. Create a website – Even brick-and-mortar businesses can benefit from a professional website with a memorable URL. Web banner ads – Buy banner advertising on websites that target your specific market. One popular idea is to include a trivia question in your ad and offer a discount or deal if the user gets it right. Viral video – A funny or impressive Youtube video can rapidly attract a huge audience. Video testimonials – Ask appreciative customers to tell their story on camera and incorporate these testimonials into your TV or Youtube campaign. Jingle – Compose a catchy tune that’s sure to get stuck in people’s heads. Include it in your radio, TV, or Youtube advertising. 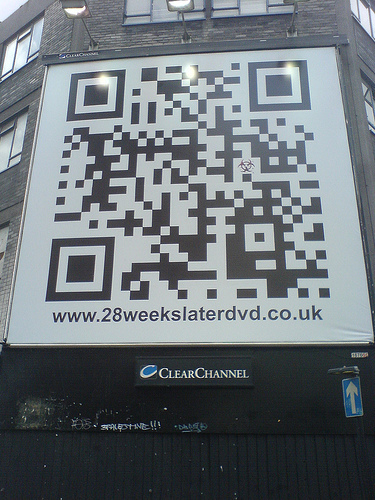 Quick response code – Add a QR code (similar to a barcode) to your printed material so that people can go directly to your website, add you as a contact, or take many other actions simply by snapping a photo. Outdoor advertising– Billboards and signs can direct people to your business from a unique location. This could include an ad at your local sports area. Windshield pamphlets – Place eye-catching fliers or postcards under the windshield wipers of cars in a crowded parking lot. Undercover marketing – You can artificially inspire “word of mouth” by hiring people to discuss your product in social areas such as bars and nightclubs. Use your voice mail – Your voice mail message is a great marketing opportunity to offer special discounts or mention new products. You can even hire a professional voiceover artist to record your message. Customer testimonials – Collect these from satisfied customers and put them on your marketing materials. Dancing mascot – Have someone dress up in a silly costume and wave a sign promoting your small business near a high-traffic street. Social networking – Maintain a presence on Facebook, Twitter, or other internet social networks. Only join the ones that you’ll have time to keep up with periodically. Spotlight – Rent a big promotional searchlight for a few nights. These are very dramatic and can attract people from miles away. Bumper stickers – They’re not just for your car. Bumper stickers can be placed in public spaces as a form of guerrilla marketing. T-shirts – Create custom t-shirt with your company logo printed on them. Give them to your staff to wear, and they’ll passively promote your company everywhere they go. Say “thank you” – Follow up each purchase with a phone call, e-mail, or letter thanking the customer for their purchase. Publicity is a more subtle method used to alter your audience’s perception of your business and product. Talk to the press – Reaching out to the media about your product (especially if it’s of local interest or part of a popular movement) is a great idea. Offer free services to market leaders – Identify authoritative community leaders in your industry and offer them free products or services. They just might return the favor. Provide a tour – Offer a tour of your small business to local schools, and give the visiting students a souvenir. Many kids will discuss the tour with their parents, which is free advertising for you. Produce a “how to” show – Book some airtime on local public access cable channels. You might still have to pay for the rental of some equipment, but public airtime is free. Be sure to promote the show in print or on your website, blog, or social media network. Put on a demonstration – Demo your product for free at a related store or event. Give back to the community– Volunteering or donating ensures that hundreds if not thousands of people will hear about your business. You can volunteer as part of a non-profit organization or offer your product or service to an event or fundraiser. Sponsoring or volunteering at a non-profit event both helps out your community and enhances your company's image. Attend special events – Showing up to events that people invite you to can help to foster relationships and customer loyalty. Sponsor an event – Support important events in your industry. Events where your clients or prospects go to learn, grow and socialize are excellent opportunities to promote your busienss. Put on an in-house event – Hold an open house, business anniversary or product demo day. Invite your favorite customers and stage a visit by a local athlete, politician, news personality or sports mascot. Consider seeing if a non-profit or special interest group would like to hold an event in conjunction with your store. Conduct a business forum – Put on a networking or educational event that will attract groups of potential customers. Write a book or article – An informative publication about your specific area of expertise can help to cement your authority. Write special reports, white pages, or an e-book – Electronic publications can be offered as an incentive to people who come to your website and provide their e-mail adress. Send out a press release – A press release is a great way to mark the occasion of new products, employees, or promotions. be sure to change up the formatting of each press release so that each one stands out. Always include employee quotes and images of what you are promoting; both are integral to any journalist picking up your press release. Attend trade shows – Trade shows and other events are a great place to meet potential prospects. After you receive a business card from someone, write any important details about them on the back as a reminder and reference point. Then follow up with that person later with a personalized message. Create a blog – Use your company blog to provide interesting information and lead users to the rest of your site. E-mail signature– Don’t forget to put your website URL (and maybe a short tagline or message) in your e-mail signature. You’ll promote your small business with every e-mail you send. Submit articles to online magazines – Writing guest posts for blogs in your field is a great way to get your name out there. Create a podcast or video podcast – Video and audio is a unique and compelling way to increase your web presence. Comment on message boards and forums – Create posts on Internet forums related to your industry. Valuable comments can help attract appreciative prospects. Host or attend an online event – Web seminars or conferences are a great opportunity to network. Host a company gathering – A barbeque or group outing won’t just make your employees happy. If they’re permitted to bring friends or family, it may attract them to your business as well. Flash mob– This is a fun promotional stunt that people love. 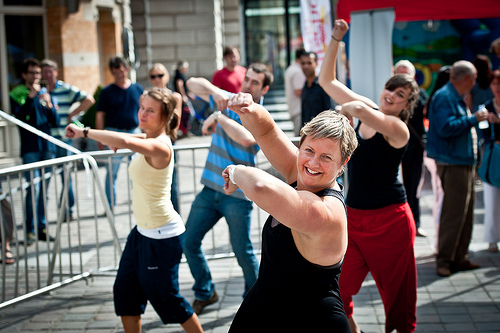 Organize volunteers to do a dance or other activity in a popular area at a specific time. Consider having someone videotape it and then upload it to Youtube. Holiday cards – Send your customers a promotional greeting card or e-card for the holidays. Business partnerships – Form a bond with other small businesses in different industries. A mutually beneficial partnership lets you cross-promote and target the same market together. Attend a “career day” – Volunteer to give a speech or presentation at a career day at an elementary, middle or high school. Go green – Make your products or services eco-friendly. 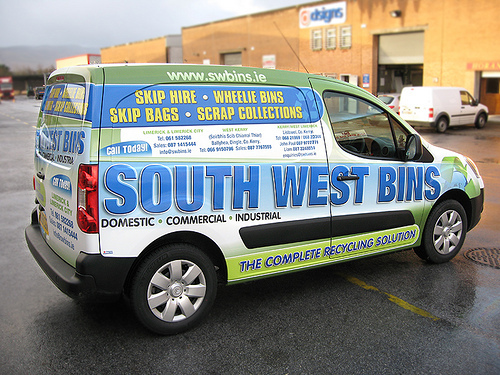 Advertise your environmentally safe practices, and people will respect you more for it. Awesome, thanks! We’d love to hear how they worked out for you. Very informative. I will have to try some of these ideas. Its practical, informative, and works!! Good stuff, real good stuff. Thanks, a well collated list! We have an online business. We leave business cards at related stores in the town and in return offer free links on our website for there businesses. Seems to work. Thank you , some great ideas to promote our business. Seeing as Christmas is almost here, why not change your current marketing strategy from sending cards to all your cherished employees and clients to sending personalised imprinted Christmas Tree baubles instead? It will definitely be something that will get your company recognised and also at the forefront of your customers’ minds, especially at this time of year where they get so many boring Christmas cards. Great ideas!! I will definitely try! Very Good I must implement some of them..
80 promotional idea is a big list. Definitely, some are effective and some area old tradition. However, if you could short this might be more helpful. Thanx for big sharing. I liked the offline part, most of the time we invest so much at online marketing but forgot offline marketing.